Watching nine of my peers start an indefinite hunger strike to get Senator Diane Feinstein to champion the DREAM Act as a stand alone bill brought me back down to earth. Knowing that they’re going to be depraving themselves of all food except water for the next few weeks is nothing short of amazing. The hunger strike is in solidarity with the 21 students that participated in civil disobedience in Washington D.C. yesterday, two of them here from L.A. All across the United States, undocumented youth and allies are working on making the DREAM Act happen this year because immigration reform is an idealistic, farfetched dream right now. The current IR bill would mandate more enforcement and laws than new path ways for people to adjust their legal status. Immigration Reform is dead and people need to realize that by passing the DREAM Act first, we are creating a path for just and fair Immigration Reform that will help people, not just imprison and deport them. Come and show your support as they hold down the corner of Sepulveda Blvd. and Santa Monica Blvd. in Westwood. It’s funny, the things you see sitting and watching the world drive by. Angry honks of road rage. Angry yells of idiots who talk out of their ignorant asses. But also to personally speak with people out on the streets, explaining to them what they are doing, what the DREAM Act is and why they are doing. Wishing us luck on the campaign and saying they support the cause. If you would like to help the cause, give her a call or two and tell her you support the DREAM Act as a stand alone bill and that she should get cracking on it (310) 914 – 7300. 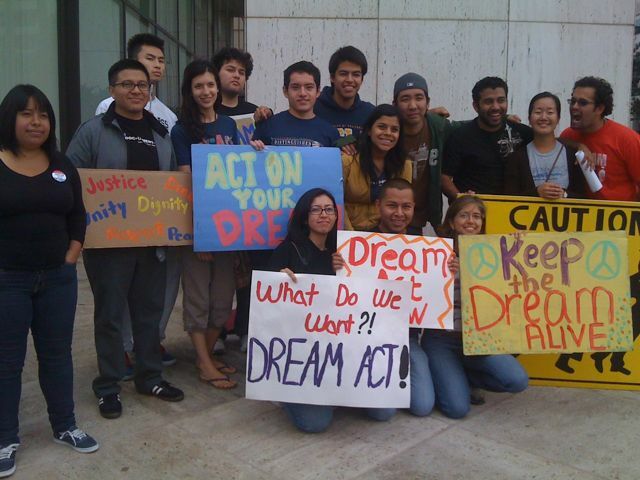 Feinstein already supports the DREAM Act, but that’s not enough. She has the power to put it up in the Senate so it can be voted and passed. Sim ply saying you support something to get people off your back isn’t enough. 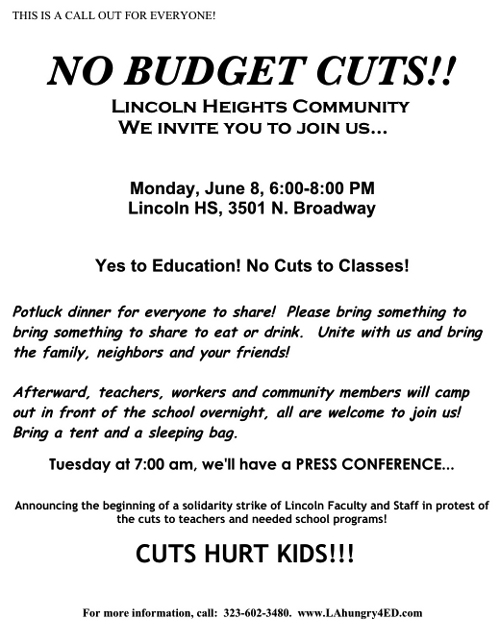 The flyer pretty much sums it up ; Lincoln High School Teachers/Faculty and more are protesting @ Lincoln High School through the evening…and into the morning. This is late notice but be sure to spread the word that such an ACTION is happening. These sort of ACTIONS lose any power if no one knows about them! This also late news but bestselling writer, Luis J. Rodriguez, author of “Always Running” will be there at 8pm tonight!